The first problem set is now posted. Prof. Abanov (SCGP) has an online list of the most commonly used homotopy groups of Lie groups and homogeneous manifolds. Pierre Cartier wrote a primer on Hopf algebras that includes a wonderful history of the topological study of Lie groups. Prof. Helgason (MIT) has made available several of his fantastic articles on the history of Lie groups under "Additional Readings" on his OCW website. Regarding the ongoing discussion in lecture about the cohomology of Lie groups and their flag manifolds, students might find the following MathOverflow question interesting (Borel's Theorem for other coefficient rings than Q). In particular, the article by Demazure linked in that post settles the question. Course Description Description in the graduate bulletin. "Lie algebras. Foundations of Lie groups and Lie algebras, classical groups and homogeneous spaces. Abstract Lie algebras. Basic representation theory of compact Lie groups." A Lie group is a differentiable manifold with a smooth group structure, and the induced structure on the tangent space of the manifold at the group identity is a Lie algebra. Lie groups arise as symmetry groups in many other mathematical subjects, which makes them central objects of study. This course studies Lie groups as important examples of differentiable manifolds, but we also explore the structure theory and classification of Lie groups and Lie algebras. Prerequisites Students should have passed the graduate algebra sequence or its equivalent and understand the basics of differentiable manifolds. Text There is no required textbook. 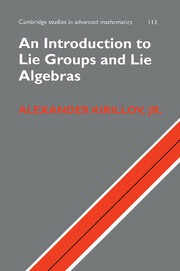 The recommended textbook is An introduction to Lie groups and Lie algebras by Prof. Alexander Kirillov, Jr. For the theory of finite-dimensional complex linear representations of complex semisimple Lie algebras, I also recommend Representation theory, a first course. by William Fulton and Joe Harris. For the algebraic side, there are excellent books by Springer, by Humphreys, by Borel, and by Bourbaki. Lecture is held Mondays and Wednesdays, 2:30 PM  3:50PM in Library N3033. Grading System Grades are based on class participation, on performance on assigned problem sets, and on a final 20-minute oral presentation on a topic related to the course and approved by the instructor. If you have a physical, psychological, medical or learning disability that may impact your course work, please contact the Student Accessibility Support Center, ECC (Educational Communications Center) Building, Room 128, (631)632-6748. They will determine with you what accommodations, if any, are necessary and appropriate. All information and documentation is confidential. Students who require assistance during emergency evacuation are encouraged to discuss their needs with their professors and the Student Accessibility Support Center. For procedures and information go to the following website: https://ehs.stonybrook.edu/programs/fire-safety/emergency-evacuation/evacuation-guide-people-physical-disabilities and search Fire Safety and Evacuation and Disabilities. Academic Integrity Each student must pursue his or her academic goals honestly and be personally accountable for all submitted work. Representing another person's work as your own is always wrong. Faculty are required to report any suspected instances of academic dishonesty to the Academic Judiciary. Faculty in the Health Sciences Center (School of Health Technology & Management, Nursing, Social Welfare, Dental Medicine) and School of Medicine are required to follow their school-specific procedures. For more comprehensive information on academic integrity, including categories of academic dishonesty, please refer to the academic judiciary website at https://www.stonybrook.edu/commcms/academic_integrity/index.html .